Lok Sabha Election 2019: Popular film actor Dharmendra on Sunday repeated his famous dialogues from the Hindi blockbuster Sholay*as he campaigned here for his wife Hema Malini in the Lok Sabha elections. Lok Sabha Election 2019: Dharmendra Screams ‘Gaaonwalo’ To Appeal For Wife Hema Malini In MathuraMathura goes to the polls on April 18. Addressing BJP supporters, Dharmendra praised the Narendra Modi government. On persistent demands, he repeated his famous dialogues from “Sholay“. He called himself a farmer and appealed to local farmers to strengthen the BJP. He said,* “Gaaonwalo, agar aapne Hema ko badi jeet nahi dilayi… tanki kidhar hai?” (People, if you didn’t help Hema to acquire majority this election… where’s the water tank?). The ‘water-tank’ reference was from his movie ‘Sholay’. Bharat EXCLUSIVE: Not Just 5 Posters, Salman Khan & Team Have BLOCKBUSTER SURPRISES In Kitty For Us! Her farm woman avatar, wherein she joined farmers and tried her hand at cutting the wheat crop in this region in Uttar Pradesh, invited not just scorn from the opposition but also the tag of ‘drama girl’ over the ‘dream girl’ she has been known as. 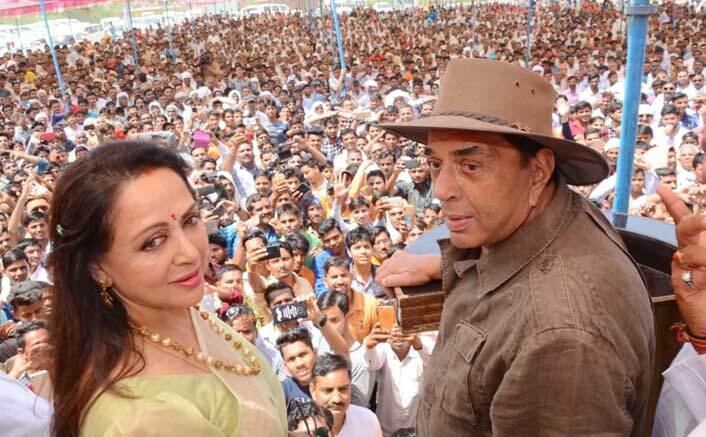 The post Lok Sabha Election 2019: Dharmendra Screams ‘Gaaonwalo’ To Appeal For Wife Hema Malini In Mathura appeared first on Koimoi.